Since it first hatched in 1993, Stiles and Drewe’s musical Honk! has winged its way around the world in over 8000 productions, on many different stages and in many different languages. Seen by over 5 million people, Honk! has won multiple awards including the 2000 Olivier Award for Best Musical – beating the Lion King and Mamma Mia for the prize! 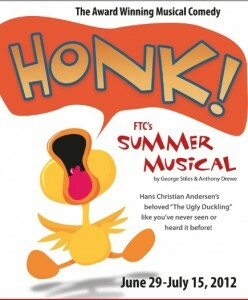 Based on Hans Christian Andersen’s “The Ugly Duckling,” Honk! Tells the story of an odd looking baby duck, Ugly, and his quest to find his mother. Soon after Ugly is born, he is seduced away by a wily Cat who wants to eat Ugly for dinner. Eventually, Ugly manages to escape but has no idea how to return home. Along his way, he encounters a beautiful swan, Penny, tangled in a fishing line. After saving her, the two birds fall in love. However, she must return to her flock and fly south for the winter. Eventually, Ugly’s mother finds him frozen in snow. Luckily, her warm tears manage to thaw him out and he comes back to life – as a handsome swan! Soon, Ugly is reunited with Penny and the two swans decide to live the rest of their days in the same pond as Ugly’s loyal mother.